We currently have three different boats to suit all your water needs from romantic getaways to family to corporate parties or just having some fun. 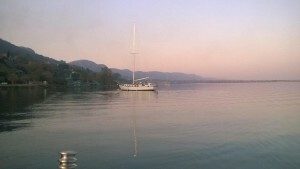 On Danny Bouy (100 seater, 2 deck boat) we can accommodate a full venue catered set up. 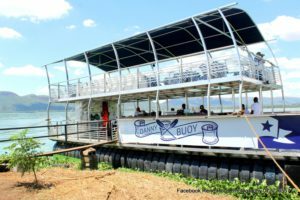 We offer daily Lunch & Sunset Cruises on Danny Buoy as well as a Sunday Lunch & Boat Cruise Package. She is also available for Private, Corporate or Leisure functions. We work from our sliding scale for private charters, we normally require a minimum of 30 guests for a private charter and the boat cruises for a minimum of 2 hours, with extra hours available for charter. This cruise will include champagne welcome cocktails on arrival, a beautiful 2 hour scenic cruise with gourmet roaming snack platters as this boat does not have a kitchen to accommodate a buffet menu. 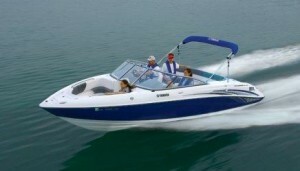 This is also a 2 deck cruiser with a bar and lounge upstairs, dance floor, kitchen and toilets downstairs. La Dolce Vita is a 14 metre Van der Stadt sailing yacht with a carrying capasity of 16 guests. Guests are accomodated in a saloon area with a music system onboard, a marine toilet and a deck area. Great for corporate team buildings and smaller groups who want to enjoy the thrill of sailing. Jet Boat A sturdy 6.5 m Panache Speed Boat which seats 6 comfortably and is primarily used for small groups and families for a day on the water. All boats used by Harties Boat Co. are fully SAMSA (South African Marine Safety Authority) compliant and all our skippers are commercially certified for you and your family’s safety.